This is one of the few video cards currently on the market which is suitable for multi-monitor UHD 4K use. Many graphics cards claim 4K compatibility but this one operates at a silky-smooth 60Hz with up to four simultaneous outputs. 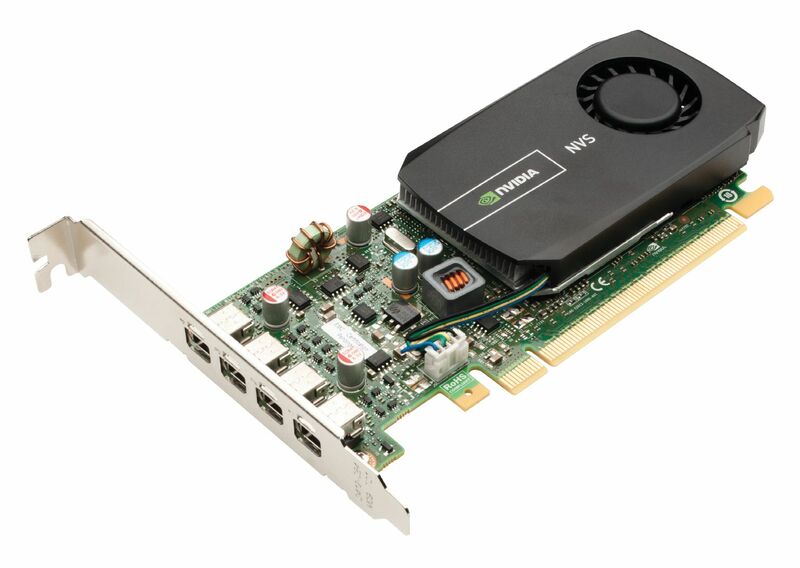 PNY's NVIDIA NVS 510 offers the latest in graphics and display technologies along with industry-leading, multi-display capabilities in a power-friendly, low-profile form factor. This makes it the ideal graphics solution for professionals who need to work with pin-sharp text and graphics, or who need to view a great deal of information in the financial trading, command and control, and digital-signage markets. Four compact mini DisplayPort connectors with a custom built-in retention mechanism let the NVIDIA NVS 510 drive ultra-high resolution displays up to 3,840 × 2,160 at 60Hz. Plus, the card supports advanced DisplayPort 1.2 features like Multi-Stream Technology and Stream Cloning which enables efficient cable management, as well as cost-effective multi-display installations. PNY provides unsurpassed service and commitment to its professional graphics customers offering: 3-Year Warranty, pre and post-sales support, dedicated NVS Field Application engineers and direct tech support hotlines. In addition, PNY delivers a complete solution including the appropriate adapters, cables, brackets, driver DVD and documentation to ensure a quick and successful installation. Please note that the b-grade version of this graphics card that is available is not supplied with any of the following: retail packaging, instructions, low profile bracket or mini DP to DP adapters. To purchase mini DP to DP cable please visit this page. The price of the b-grade item has been heavily discounted to reflect the missing items. For more information about our b-grade products please visit this page.